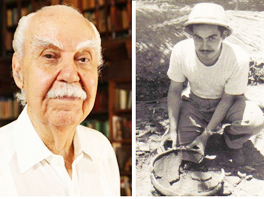 From an early age, don Ricardo developed a profound interest for the discovery of archaeological remains and information of the origin of Puerto Ricans and their culture. His curiosity became evident during his years as a undergraduate student, when he majored in Archeology at the University of Puerto Rico, Rio Piedras campus. In 1947 Ricardo Alegría Gallardo completed his masters degree in Anthropology and History at the University of Chicago, where a couple of years later (1949) he studied the influence of the African culture in Puerto Rico. By 1954, he obtained his Ph.D. in Anthropology from Harvard University. During this period he not only performed his first excavations, but he also published part of his findings related to the ball games in the Antilles, which he studied in collaboration with investigators from the Center of Archeological and Ethnological Research at the University of Puerto Rico, where don Ricardo was as a founder and director. In these publications don Ricardo explains how archeological findings can reveal a connection between two or more different cultures, even when if they evolve separately, at some point in their history the coexisted with one another. An example of this is the discovery of playing courts or "bateys" in which the ball games of the taino indians took place. These games were not only of social relevance, but they also had religious value. In this game, different Indian communities competed against each other with the mission of winning a prize offered by the "cacique", the leader of the tribe. Although, in general, teams were comprised by 10 to 30 male players, women also participated every once in a while. And distinctly from the men, whom hit the rubber or resin ball with their shoulders, elbows, head, hips or knees, the women used their knees whenever they played among them. The losing team would be the one who touched the ball with their hands the most or hit it so hard that it would get out of the limits of the court. Due to the similarities between certain parts of the taino game and the game played by the "pok ta pok" Mayan culture, Ricardo exposes how himself, and several other archeologists, believed that the game in the batey was a simpler version of that game played by the Mayas, in which they used a ring of stone to pass the ball through and score points to win. Other observations in regard to the aboriginal culture in Puerto Rico are based on explorations that led to the discovery of smaller courts in the center of the island of Puerto Rico, specifically in the towns of Orocovis, Utuado, Jayuya, Adjuntas, Lares and Barranquitas. These findings caused confusion at some point, since initially people believed that the Indians were in the coastal region. An explanation for is that living near the coast offered the Indians the possibility of dedicating great part of the land for agricultural growth and sugar cane cropping. On the contrary, in the center of the island, where most of the courts were discovered, there would be less agricultural activity. Among Dr. Ricardo Alegría Gallardo's most relevant works are the archeological investigations in the cave of Maria de la Cruz in Loiza, which led him to conclude that the Archaic Indians were the first pre-agricultural inhabitants in Puerto Rico. An important enigma that has not been easy to decipher is precisely the place of origin of this Indian community. Archaeologically, the West Indian Archaic population is distinguished by the absence of agriculture and pottery; the frequent use of caves as refuge; the absence of cranial deformation; and the absence of artifacts made out of shell, stones and ceramic. Thus, the discovery of these archaeological deposits raise an enigma about the origin of the Archaics, because beyond being found in Puerto Rico, they establish a connection with findings of pre-agricultural and pre-ceramic Indians in places like Cuba, Hispaniola and the Virgin Islands. Thanks to don Ricardo's discoveries, Puerto Rico is considered among one of the possible places of origin for the West Indies Archaic culture. In 1948, in Hacienda Grande Village site, in the municipality of Loiza, his excavations resulted in the discovery of bell-sheped pottery, flat bottles and crab remains. Today, these objects represent the earliest piece of evidence of the immigration of pottery-making Indian cultures to Puerto Rico. Don Ricardo's great contributions were not limited archaeology. He gifted Puerto Rico with his services as a historian, writer, anthropologist and fierce defendant of the Puerto Rican culture. Don Ricardo was also the founder and executive director of the Institute of Puerto Rican Culture (ICP, in Spanish), creator of the Center of Advance Studies of Puerto Rico and the Caribbean and and advocate for the historical preservation of Old San Juan. Thanks to Ricardo Alegría Gallardo's legacy, we have a window to our past, and a better understanding of the origin of the Puerto Rican civilization and our ties to the Indian, African and Spanish cultures. The understanding of our Puerto Rican culture was always don Ricardo's guiding principle and his work inspires present and future generations to take care and contribute to the Puerto Rican culture.